Publication #2 New Poem in Meniscus. Yup. it's fifty years old. What do you mean you've never read it? Or heard of it? And it won't be long til we hit the centenary of The Waste Land. And then we can all wonder why those two stand out and so few poems have matched them in the past fifty years? Lady Godiva and Me by Liam Guilar copies available. I have a few rare surviving print copies for sale, only at the website, and at sane prices. Liam Guilar, I'll Howl Before you Bury Me. 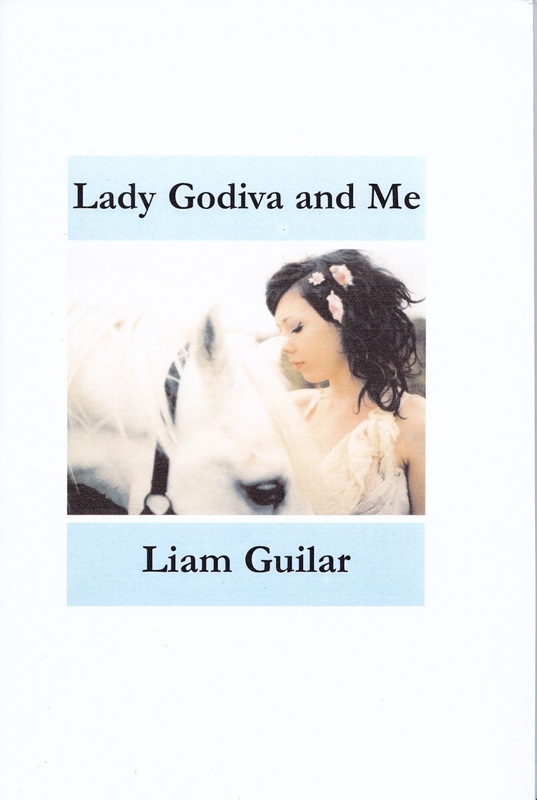 First edition print run copies for sale at sane prices. 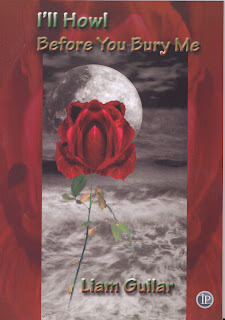 I'll Howl Before You Bury Me has been out of print for a long time. I've seen a second hand copy offered on line for over a thousand Dollars. I don't know why anyone would think it was worth that much, but it reminded me I have a dusty box of first edition print run copies. 25 Australian Dollars includes standard postage to anywhere on the planet. I'll sign and date copies on the day of dispatch. 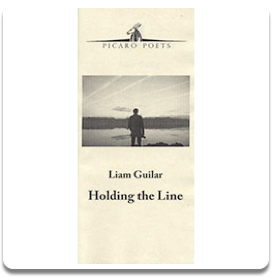 'Holding The Line': Liam Guilar. New Publication from Ginninderra press. My thanks to Brenda and Stephen at Ginninderra press. 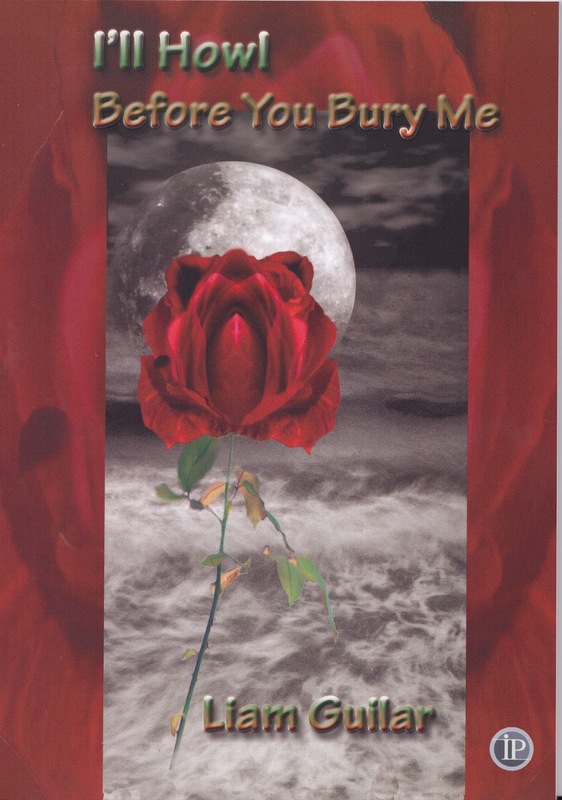 The Book review is in part one. What follows is not a criticism of Stanard’s book more thoughts provoked by it. Stanard follows the obvious path and “All roads lead to Briggflatts”(p88) and “Briggflatts was Basil Bunting’s defining triumph’ (p.117). In a recorded conversation, Hugh Kenner told Charles Tomlinson that without Briggflatts Bunting would have been ‘a minor British poet working in the Pound Tradition’ or words to that effect. Burton structured his biography to mimic the structure of Briggflatts. While I would happily argue that Briggflatts and The Waste Land are the only two successful long poems in the Modernist manner, I think that standard narrative of Bunting’s life and career should be challenged, if only as a thought experiment. Doing so might force a re evaluation of the man’s work which illuminates its excellence. I’m not about to launch into the detail such a re evaluation might require here: I’m floating it as a suggestion. The other aspect of the story that should be reconsidered is the role of Ezra Pound. Assumptions about Bunting’s relationship with Pound are used as a short cut to explain Bunting’s relative obscurity, to avoid considering what makes him unique, or to put him in a safe box where he can be ignored. Or to inflate Pound's influence and reputation. It doesn’t just gloss over their falling out; it obscures the differences between their poetry. Just as Pound never managed to write a poem to rival The Waste Land, he didn’t write anything that was as good as Bunting as his best. Bunting wasn’t a slavish disciple. 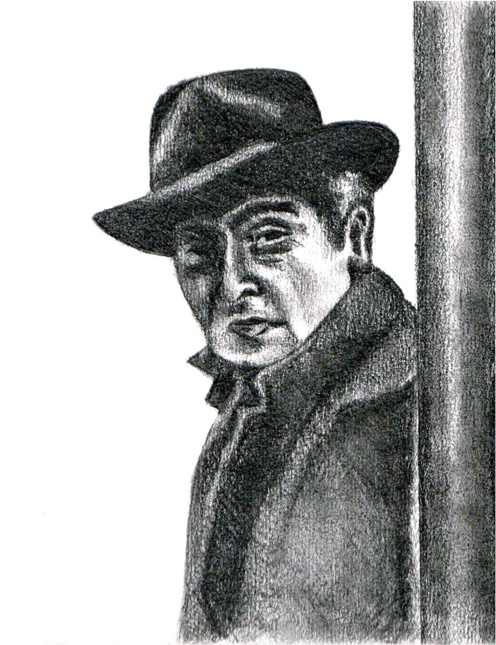 He was too bloody-minded to be anyone’s acolyte. Put Bunting’s Odes beside Pound’s shorter poems and Pound's don’t come off well in the comparison. Put Villon beside anything Pound had written to that point (mid 1920s) and see which is better? 'All roads lead to Briggflatts' because it’s used as a vantage point from which to look back over the life and career. Inevitably this confers retrospective coherence and significance. It’s difficult not to do it because there’s the feeling that in writing the Big B he solved the problems that produced flaws in the earlier pieces. But reading everything as a progress towards that one poem implies that the only interest the earlier poems have is as failed experiments on the way to a singular success. As a thought experiment, acknowledge the brilliance of Briggflatts, and then imagine Bunting’s Collected without it. This would force attention on to the individual poems. The Odes, like the Sonatas, are uneven. Being uneven is not a criticism. It's hard to imagine a Collected works which doesn't deserve that epithet. But it might be interesting to argue that Bunting’s development had more in common with Yeats’ than Pound’s or Eliot’s. There’s not a great deal of development in style or form or technique across Yeats’ or Bunting’s Collecteds, rather an ongoing refinement. Whatever Bunting had, like Yeats, he had it from the start, and while their contemporaries were off to redesign the spoon, and discovered the spoon is the way it is because it works best the way it is, Yeats went on refining and improving the lyric poem and Bunting went on hitting and missing the mark he seems to have been aiming at. From the start of the Collected the poetry has a characteristic drive to reduce, condense and omit. It never has the bookishness of Eliot or Pound. Never explain, said Bunting, your reader is as smart as you are. Which is an ideal to aim at and OK if your readers are Zukovsky, Pound and Yeats. When Bunting gets it wrong, the drive to omit and condense produces a ‘terse’ expression that gets to pithy and stalls. He makes the mistake he criticized Pound for; alluding and not presenting. Some of the Odes and sections of the failed Sonatas read like private messages that lack any kind of public context. The reader is a mere third party observer overhearing less than a complete conversation. When he gets it right, the drive to condense and omit produces poetry, but it’s ‘terse with music’ and a treatment that presents what’s happening so the reader can follow. Often the poems combine the diction and syntax of everyday speech without affectation. This wasn’t something he finally succeeded in doing in Briggflatts at the end of his writing career. It’s there from the start. Leaving Briggflatts and Pound out of the discussion does not deny their importance, but it might lead to an interesting valuation of Bunting as a poet. However Kenner might have wanted to define ‘minor’, and it should be said that in print he was much more enthusiastic about Bunting’s work, Villon is not the work of a ‘minor poet.’ Nor are some of the Odes and Overdrafts. Julian Stanard. Basil Bunting. Writers and their work. First the Mini book review. Readers of this Blogg (all two of them) may find some things being repeated. This is an fine, short introduction to Bunting's work. For a man who was widely regarded as one of his country's leading poets at the time of his death, Bunting is all but invisible today. Books about him are rare. I think this is only the third full length treatment of the man and his work, and while it won't supersede Peter Makin's Bunting; the shaping of his verse, that book is hard to find and second hand copies are expensive. One of the reasons Bunting is all but invisible is that his poems are hard to write about. They either attract a detailed exegesis of all the allusions, which can be overwhelming, or a brief nod to sound and technique that doesn’t take up much page space. Stanard walks the line between the two extremes and manages to give any new reader reasons to read the poems, while still having enough to say to make the book useful to Bunting addicts. Bunting divided his work into three groups: Sonata's, Odes, Overdrafts. The Sonatas are long poems, his career is almost bookended by two; Villlon and Briggflatts. But he also wrote excellent short pieces: the Odes. His translations, from what is an impressive range of languages, he called Overdrafts. In such a short space Stanard obviously has to choose what to discuss, and he chooses to devote more space to the Sonatas and to Chomei at Toyama. Perhaps it's not done in a book like this, but it would be possible to suggest that while the Sonatas, Attis and The Well of Lycopolis are essential reading for Bunting devotees, they fail as poems, thus freeing space because some of the Odes deserve and would benefit from a decent discussion. The only reservation I have about this book has nothing to do with Stanard or his publisher. But as it will be the most available introduction to Bunting, it's a pity it was written before Stanard could access Richard Burton's excellent new biography: A Strong Song Tows Us (2014), which replaces/updates/makes redundant The Poet as Spy and probably will remain the definitive biography given publishers' lack of interest in Bunting. For those interested in Bunting as Translator, Don Share's recent edition of Bunting's Persia (2012) was also probably too late to be included. So the Rancorous Old Sod [His term, not mine] has finished his five year stint as Oxford Professor of Poetry. It seems a long time since the scandal that cleared the field and lead to his election. If he wasn't one of the initial frontrunners, it has been fortuitous that he got the post. The current batch of candidates for his place don't offer anything like the same possibilities. The Field of Cultural production that is poetry is characterised by the bitterness with which the inmates attack each other. Opinionating on poetry litters the media, facebook is full of it, and anyone who wants to can set him or her self up as a "poet" or "critic" and mouth off. So it's good that someone like Geoffrey Hill got the opportunity to argue his version of poetry in a public forum. It's not a popular version. As one commentator noted after the first lecture, students were being exposed not just to someone who cared, but to someone who had spent his life scrutinising the art. It's lunatic to think you have to agree with everything anyone says. But the challenge here is to be able to articulate the objection. The lectures, like Hill's published criticism, aren't "easy listening". They don't walk a straight line to a soundbite. There was no final summing up in the last lecture and he resisted the temptation to go out with all guns blazing. Perhaps he has been a little too aware of the dignity of his office, but the lectures were always thought provoking. A vote of thanks to whoever decided to make them available as podcasts. Hopefully, they will soon be published. Hill said in this last lecture there is not one simple narrative of poetry in English, but narratives. It has been a privilege to hear his version. It's not comfortable, but it comes out of a sustained consideration of the art of poetry which produces work and opinions that require and reward an equally sustained consideration. "I am not interested in self-expression: I am interested in expressiveness." You can find the last lecture at the link below. Mark Knopfler's song Basil....about Basil Bunting. Mark Knopfler's song about Basil Bunting. If you're interested in who the song is about, read Tim Burton's recent biography 'A Strong Song Tows Us' or Julian Stanard's 'Basil Bunting' in the Writers and their work series. Or just read 'Briggflatts' as a start. Sadly the speed of this you tube version is so wrong it sounds ......lugubrious...which it doesn't on the album. If you want to listen to the song then up the speed to 1.25. The Song 'describes' Bunting during his later years, drudging for a local paper. Who knows, now he's the subject of a song by someone famous people might go read the pomes. Who knows, Faber might even get their act together and publish the long promised collected. Today's set questions explore the way the strange beliefs about poetry and poets, which you have studied dating back to Sidney, underwrite various statements. "If a poet meets an illiterate peasant, they may not be able to say much to each other other..."
A) Discuss the underlying arrogance in this statement. What does it reveal about Auden's conception of the poet and his attitude towards the 'Illiterate peasant'. You may use the word stupid in your essay. B) Why cannot an illiterate peasant be a poet? Consider your answer carefully before you start writing. C) As a cultural critic, consider the broader implications of the fact that someone could write this and be considered intelligent, perceptive and worthy of attention.